Charles Frankenbach, Walter Kent, Edward Sayre, Harry Wilde, Thomas H. White Sr.,Fred Phillips, Ernest Edwards, Leland Thompson, Charles Edwards, Aurthur McGowin, John Phillips, Emmett Youde, William Cotton. The original by-laws were adopted June 30, 1913 and have been revised several times since. The development of equipment between of founding of the Southampton Fire Department in 1881 and the establishment of the Agawam Hose Co. in 1912 saw amazing changes. In 1891, a new hose cart was purchased from a donation from H.G. Trevor. Three other karts were purchased at different time and these were kept in four separate buildings strategically placed around the Village. The equipment was all hand drawn, using horses when available. Until 1912 era when the first gasoline powered equipment was used. 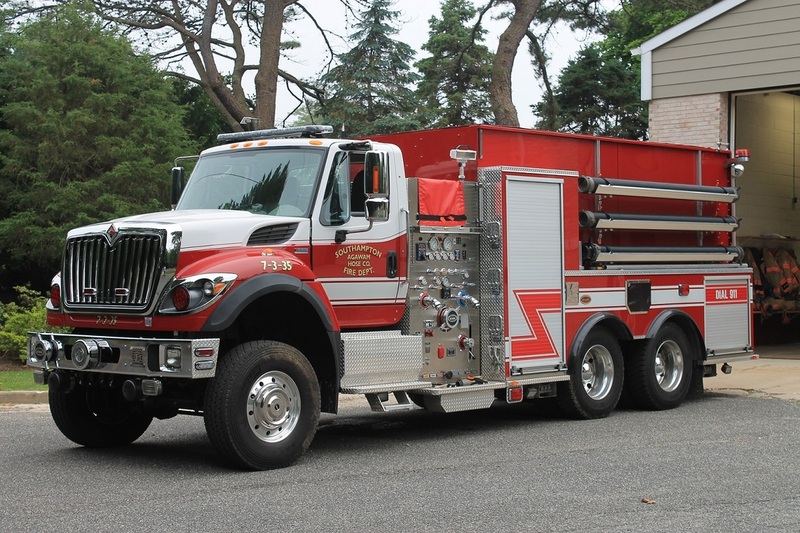 The new truck purchased for the Agawam Hose Co. was a right hand drive Orson. It is noted in the minutes that on December 26, 1914 a motion was made and seconded by the Hose Co. that the secretary write a letter to the Southampton Village Trustees asking to be accepted as a motor company, and that they accept the company apparatus for fire purposes. Several months later the Village Trustees acknowledged the letter and the use of the car could be for fire purposes. Over the years the apparatus changed greatly. The company had a 1937 GMC Hose Wagon with an open cab. This remained in service until 1969. The next truck was a major upgrade in the fact that it had a pump, and enclosed cab, and a radio. This 1969 Ford was a cab over with a side mount pump. This truck remained in service until 1992 when we received our current truck, a 1991 KME side mount pumper. At its inception, we were stationed at the original firehouse on Jobs Lane. Not long after we moved to the main house on Windmill Lane were we stayed until 1992. Soon after our new truck was purchased, we were moved to the Shinnecock Hills Substation were we are today. At a general alarm if our truck is the attack pumper or source pumper, unit 11 and the Agawam Hose Co. members can be found performing orders from the officers and chiefs along with working side by side with other department members. As the fire service has evolved over the years, the need to organize the district into three zones was realized in the mid 1990’s for smaller fires, medivacs and car fires. Each zone was assigned a class A pumper to respond. Unit 11 covers the western part of the district better known as zone 3 out of the Shinnecock Firehouse.